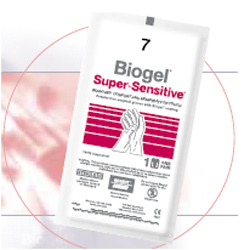 Biogel Super-Sensitive surgical gloves were manufactured for situations where surgeons require the highest levels of sensitivity. The Biogel Super-Sensitive glove is about 20 percent thinner than standard latex surgical gloves to achieve the highest level of tactile sensitivity while providing adequate protection to the clinician. Developed for use in microsurgery procedures, Biogel created the Super-Sensitive surgical glove with a smooth surface. The end result is a latex surgical glove that feels like a second skin. When the thin surgical glove was first introduced, one of the primary concerns of clinicians was the level of safety. You can rest assured that the Biogel Super-Sensitive glove undergoes the same stringent testing of other Biogel gloves to ensure surgeons are protected from viruses and other harmful bloodborne pathogens. Today, Biogel Super-Sensitive gloves are very popular even for general surgery because it has been touted as the most comfortable surgical glove around.